Are you looking for an extreme adventure with your hybrid bike? Consider yourself lucky because Schwinn Discover Men’s Hybrid Bike is perfect for you. Schwinn Discover Men’s Hybrid Bike is perfect for bikers who wanted their mountain bike adventure to be comfortable with an excellent style. The bike has padded saddles that will make you feel comfortable; it also has a swept-back handlebar that looks cool and exciting. And if you have many things to bring while riding your bike, then no need to worry because it has a rear gear that can fit it all, especially when you are outdoors. Schwinn’s is a brand that all bicyclists trust because they have been in the business for over a hundred years. Their bikes are sturdy, sleek, and aerodynamic, making them the highest-quality bike out there. So when i found out the Schwinn Company made the Discover Men’s Hybrid bike, I had to try one out for myself! Now, I’m an avid bicyclist who likes to ride to work and ride on the weekends for pleasure, and this is what I thought of the Schwinn Discover Men’s Hybrid Bike. Features Of course, from a company like Schwinn, there are going to be many great features on their products! First of all, we all consider the safety of our trip, of our adventure, especially with the bike that we are using. The Schwinn Discover Men’s Hybrid Bike is perfectly safe for you. Its pull breaks are made of Promax alloy that will surely secure a safe stop. This will also prevent you from accidents, unlike any other bikes that do not have reliable pull breaks. Next is it has quality parts. When we say that Schwinn Discover Men’s Hybrid Bike has every part that you need for a bike, it has suspension bike fork, SR Suntour crank, grip shifters (speeds up to 21 SRAM), and Shimano rear derailleur that is perfectly reliable. This is an infamous feature of the Schwinn bikes. It helps the seat and the bike absorb most of the shock when it’s being ridden over the uneven or rough terrain. This makes it excellent for mountain biking. Durable: The aluminum frame on the bike represents durability and ensures a smooth ride. Gear Shits: This bike has the Shimano TX-31 rear derailleur which is designed to shift gears — the main component that is present in only high-quality best hybrid bikes under 500. Double Frame: It has a double frame that can last for a long period of time. The bike’s frame is made of aluminum that is of high quality, which will make sure of its durability for your adventure. Best Brakes: The ProMax linear pull-brakes are installed for the safety of the rider. This is tailored to give greater control and will help prevent accidents. If the paddle on the seat is comfortable, then the rider will have the smoothest ride on the bike. On this bike a comfortable padded saddle is fixed with a suspension seat post. The Schwinn Discover Men’s suspension forks offer optimum response and comfort. The bike is actually made for men who are above 59″, so if you’re shorter, it’s not going to be a good fit. The gears and brakes don’t come automatically adjusted, so you have to do it yourself or take it to a bike shop to have it done. There have been instances where people complained about the bike rusting, but I’ve taken the proper precautions and have not seen this happen. The time taken to fix this manual can be time-consuming. The packaging of the product can be improved. If you’re looking to buy a cheap bike that gives you a hassle free ride, then the Schwinn Men’s Hybrid bike is your best pick. A good bike like this will help you save on your expenses. 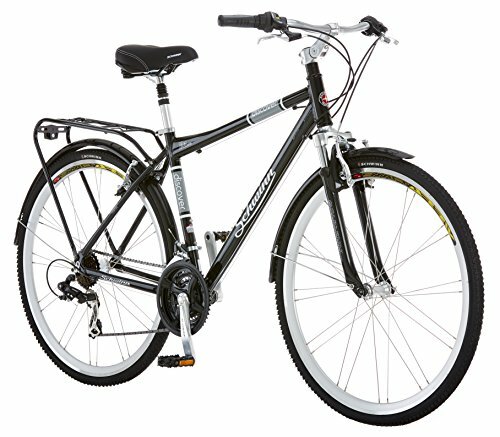 This bike is great on quality, is affordable bike and has a brand name to it if you love cycling then, the hybrid bike is for you.